Collected images from Star Wars Galaxy of Adventures. Star Wars fans who have kids that aren’t quite ready to sit down for multiple two-hour movies can rejoice today. 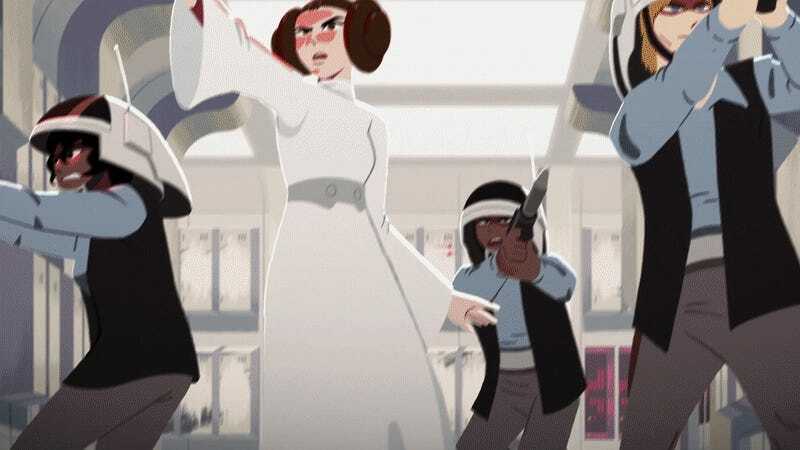 Disney has announced Star Wars Galaxy of Adventures, a series of animated YouTube shorts using original dialogue and sounds from the Star Wars films to introduce the franchise to a new generation. The first six shorts debut November 30 on a brand new Star Wars Kids YouTube channel, and here’s a trailer. This show will hopefully do that by using accessible animation, and a very familiar outlet, to set up kids not just to see the current movies, but for a little something coming next year. “With Episode IX coming in December , and being the conclusion of the Skywalker saga—the long journey over 40 years of storytelling comes to its end—Galaxy of Adventures walks through the great moments and themes of the stories that led us here and introduces a new generation to them, in time for many to see this finale,” Waugh said. Now, obviously, most of us aren’t the intended audience for these shorts, but the idea is sound. Carve down these beloved films into easily digestible bites for the YouTube generation, which then could lead to them becoming fans moving ahead. It’ll also be very interesting to see how, or if, they handle some of the franchise’s darker moments. The first six shorts, a designation which implies more are coming, are out November 30.